This is part 2 of a two-part blog on a recent trip to Tasmania. The first part is here. We left Cradle Mountain National Park mid-morning with our next destination being the east coast of Tasmania, specifically Swansea. Our friend Amanda had booked us into a little cabin that had a fabulous view back across Coles Bay to Freycinet National Park. 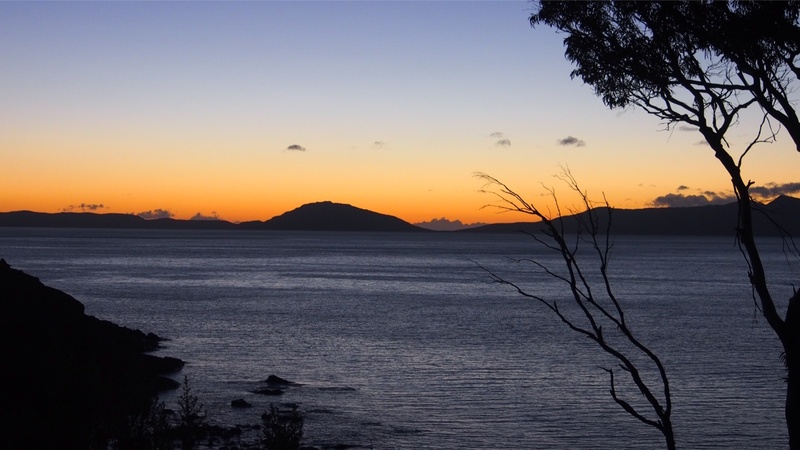 With the short days and our stop in Bicheno to buy food supplies, we arrived at Hamptons on the Bay just after dark, but not before stopping on the road to catch the last light in the sky looking east. Next day we headed off in promising sunshine towards Freycinet National Park where we planned to walk from the visitor’s centre across the saddle and down to the famous beach at Wineglass Bay. We weren’t on the road long when a large grey cloud came into view. By the time we got to the park the rain was coming down in sheets. Roo and I were prepared with sturdy boots and coats that kept us dry in Patagonia 18 months before. 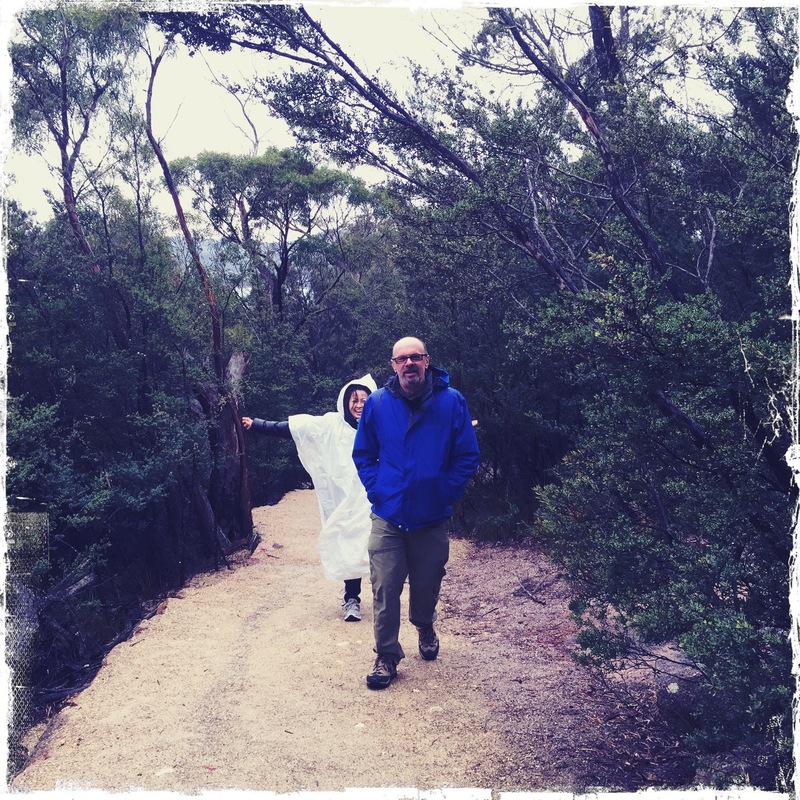 But Amanda was forced to don my emergency white poncho so her down jacket did not get soaked! It was a ghostly sight her flapping around in the wind and rain behind Andrew as we made for the top of the climb. The rain let up for a bit and we were able to see the freshly washed trees and plants glistening. It wasn’t overly cold but very damp and fresh by the top of the saddle from where you can see out to Wineglass Bay. But as we got to the top the rain just pelted down again. Having done this walk before we knew that there was a bit of clambering downhill to the beach and that it was slippery with loose rock, even in the dry. We made the decision to turn back as the rain showed no signs of stopping. During the break in the rain, we did capture some scenes of the surrounding bushland. After our aborted hike, we headed back out the National Park Road towards the highway. On our way in we had spied a sign for fresh seafood so we decided to pull in and have a look as it was almost lunchtime. Fresh seafood is naturally a feature of an island and Tasmania’s clean waters are a boon for fish lovers. To our delight there was a big undercover seating area attached to a basic kitchen where three women were shucking fresh oysters, cooking fish, steaming mussels and frying potatoes. We ordered up a few trays of food without hesitation and dug into a feast of fresh seafood. This more than compensated for our curtailed hike and there were smiles all around the table. The next stop on our trip was on the way back to our accommodation on the Tasman Highway (we’re talking two-lane road here, not some superhighway). 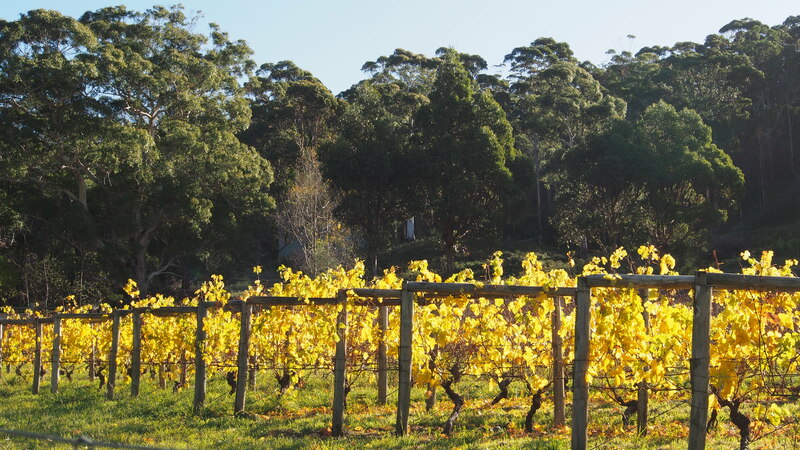 Having passed the vineyard and olive groves on our way up and down to town and the National Park, we were keen to try the local wines and olive oil produced by Freycinet Vineyard. The main vineyards are tucked into a protected valley that gets plenty of sun. The olive trees are close to the main road and you drive through both vine and orchard on your way to the cellar door tasting room. We were greeted by the smiling and cheerful Jennifer, a young German woman on a working holiday visa who was living locally and working in all capacities around the vineyard. Pinot Noir grows well in Tasmania and the 2013 Freycinet Pinot Noir was a revelation with the right ratio of spice to cherry. Also available for sampling was the cold-pressed, unfiltered, extra virgin olive oil. We enjoyed its rich taste and fragrance so much we bought a bottle for comparison with the warmer climate, local South Australian olive oil we use at home. Our last stay of the trip was to be at an Air BnB apartment in Hobart. We left the east coast and slowly made our way down the coast on a mostly sunny afternoon. In and out of rain showers we were treated with many rainbows that never failed to thrill us like little children. 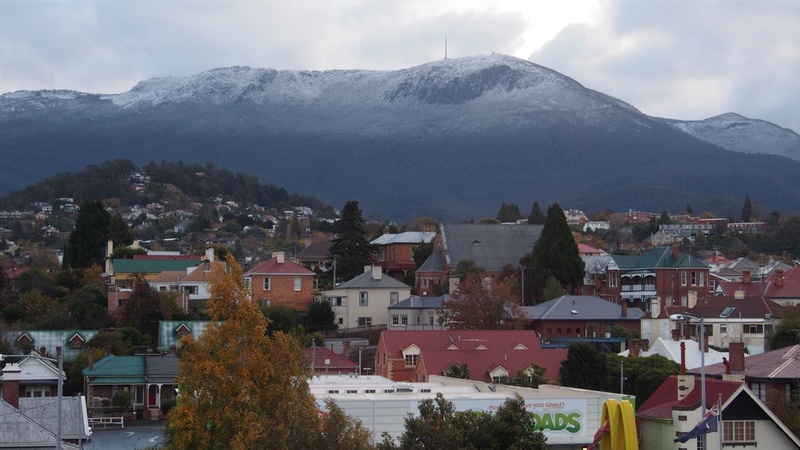 We arrived at our apartment with plenty of daylight and were treated to a spectacular view of Mt Wellington from the big expanse of glass in the dining and lounge areas. It’s notoriously cold and windy up on the mount and we watched the weather change over the next few days. Sometimes the top of Mt Wellington was visible but the middle was shrouded in fog. When the cloud and mist blew away, there’d be a lower line of snow dusting the slopes. Just a spectacular position we had (even if we did feel the full brunt of the wind on the windows which seemed, at times, like they might blow in). 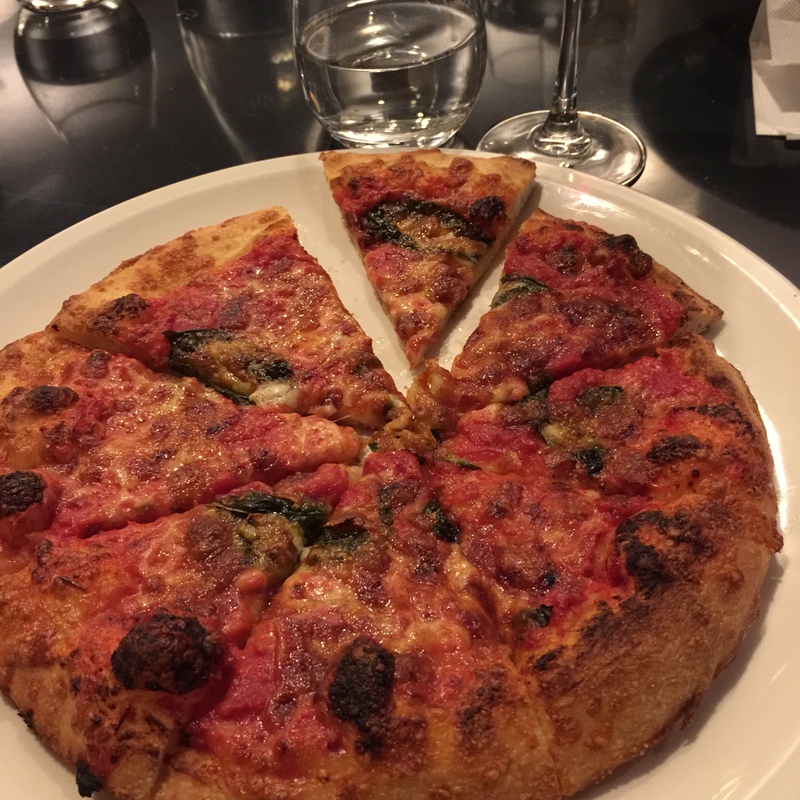 While driving down to Hobart we decided to try our luck at getting a reservation at the well-known Da Angelo Italian restaurant in Battery Point. Fortunately, they were able to squeeze us into the big welcoming dining room on a packed-out, cold Wednesday night. I had dined there a few times in 2000 when it was new, and had never been served a dud meal! We were not disappointed. 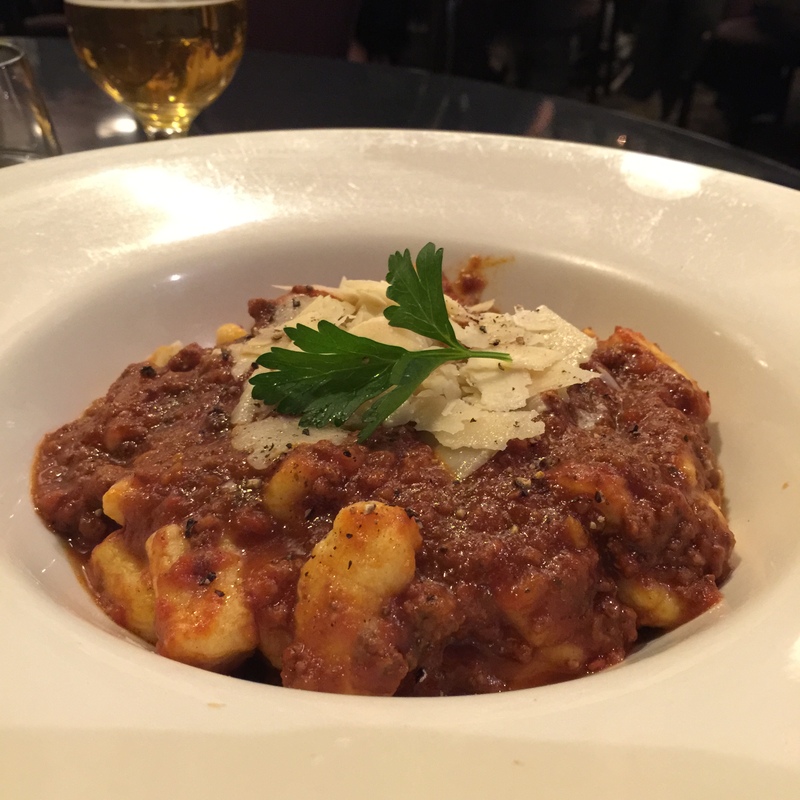 Da Angelo serves classic Italian dishes plus speciality dishes from the Molise region of southern Italy. 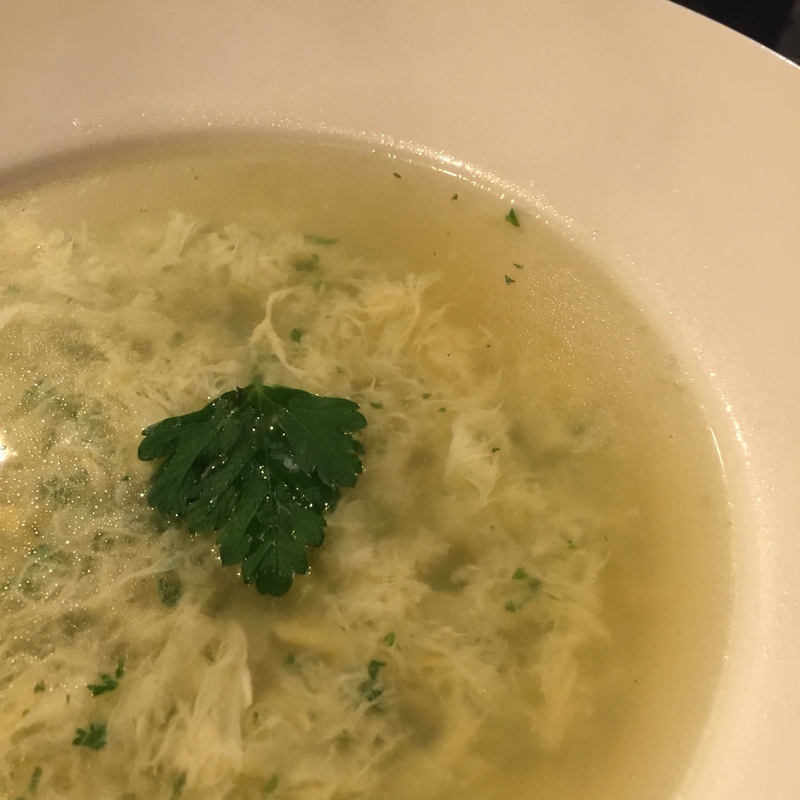 We dined on gnocchi, pizza and my favourite, the Stracciatella soup, a chicken broth with lightly beaten egg, parsley and parmesan cheese. 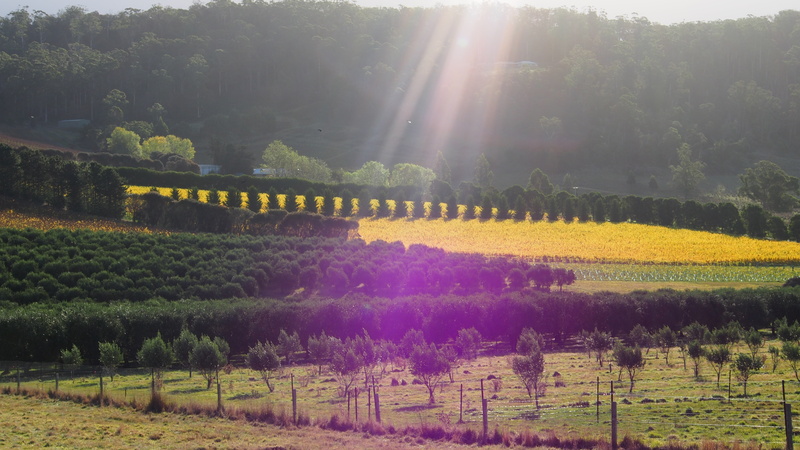 On Friday we drove south towards the Huon Valley with no real destination in mind. 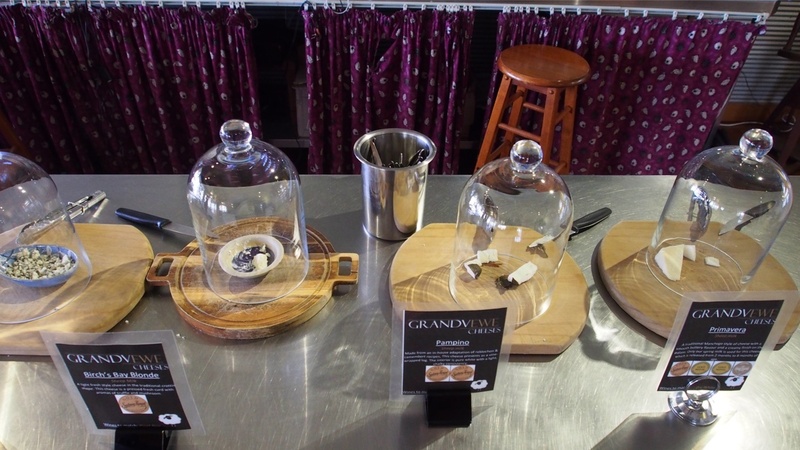 After a chance discussion with a local, we stopped in Kettering to sample some chocolate in an unlikely little shop attached to a cafe, the whole thing a former service station. 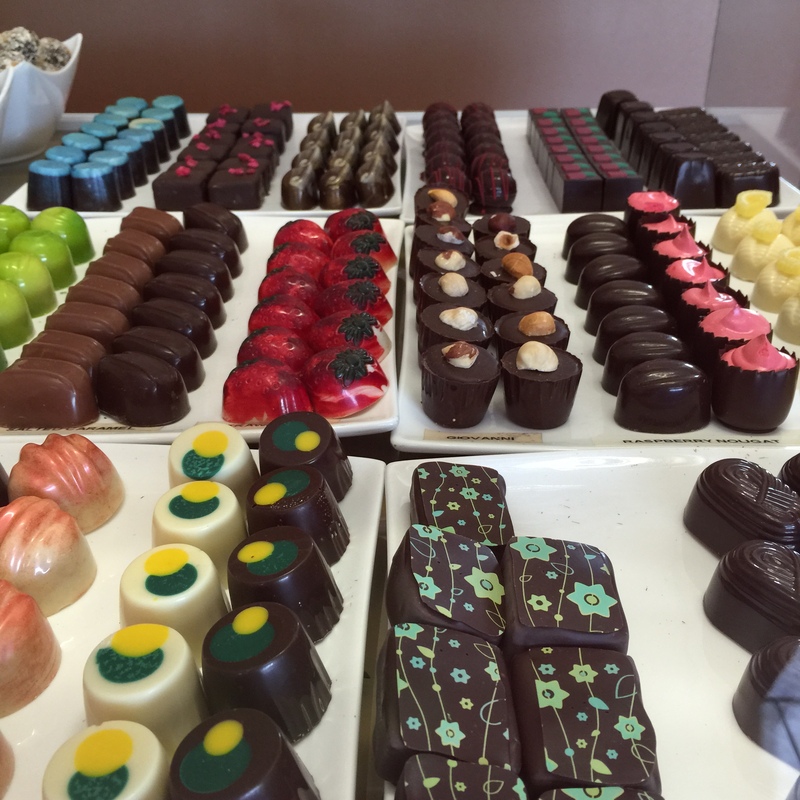 Inside Nutpatch Confectionary is a colourful array of chocolates made by John Zito, a former schoolteacher turned chocolatier. He doesn’t advertise and doesn’t need to. 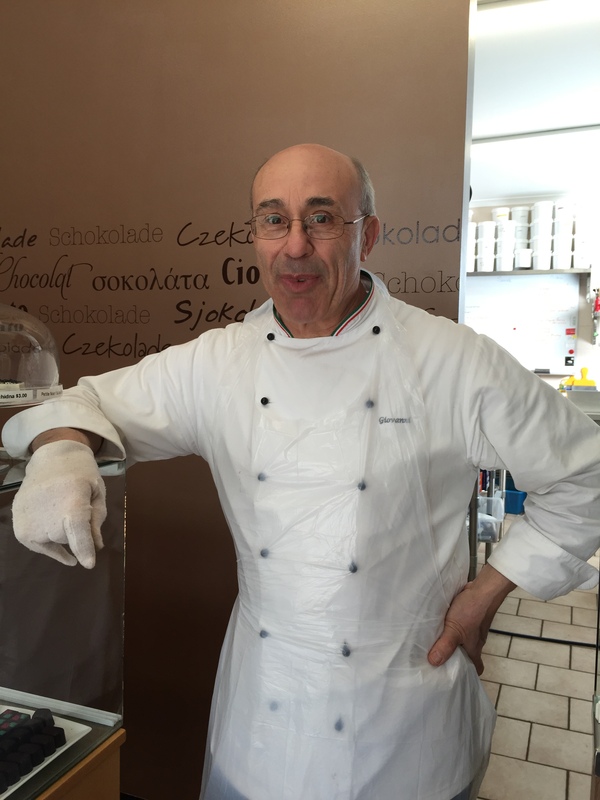 His chocolates and nougat receive orders from far-flung places and he keeps busy. But not too busy to have a chat with us about his craft. We are so glad we stumbled upon Nutpatch and were able to, ahem, help the local economy by buying a few items for ourselves and as gifts. 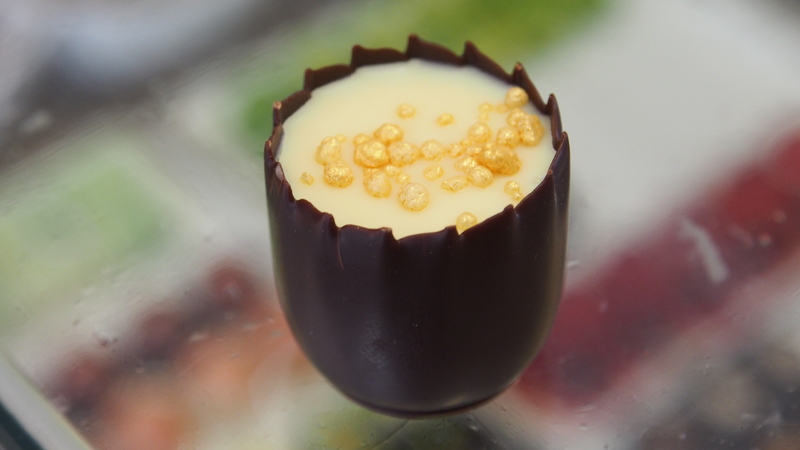 That Creme Brûlée truffle was an absolute stunner. As John was born in Italy and has a connection to the motherland, we naturally spoke of things Italian. When I told him of my Abruzzo heritage he asked, if I liked pecorino. I replied, “the wine or the cheese because I like both”. 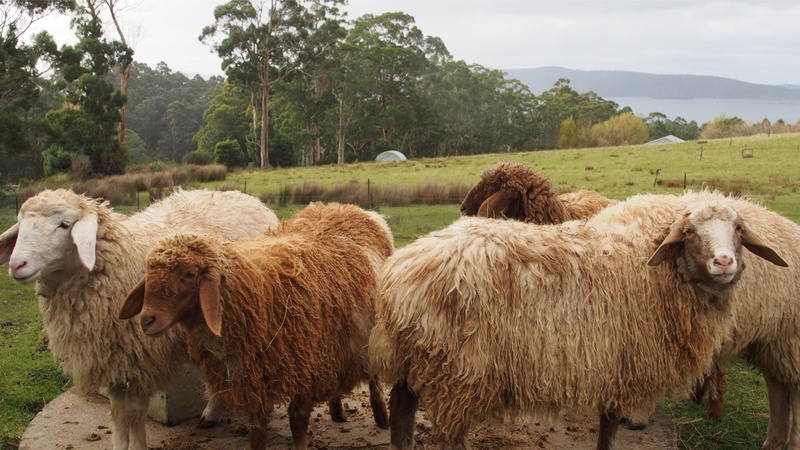 Well he didn’t know about the wine but he suggested we drive south through the next town, Woodbridge, and look out for Tasmania’s only Sheep Milk Cheesery called Grandvewe. We found it easily, just 3 kilometres out of town. Inside we tasted a range of very delicious sheep cheeses, but the Pecorino was unfortunately sold out. We liked all the cheeses and I was surprised to find out that 98% of lactose-intolerant people can tolerate sheep mild cheeses with no problem. My favourite cheeses were the manchego-style Primavera and the vine-wrapped Pampino. Again, we helped stimulate the local economy by taking some cheeses with us. The daylight almost over, we headed on for a drive along the valley, stopping to buy apples and find a cafe for a somewhat late lunch/snack. Always thinking about the next meal, we stopped at a country butcher and bought some pork loin chops as we already had apples. Next stop was Pagan Cider along the highway at Cradoc. We tasted the standard Apple, Pear and Cherry (Cerise) ciders as well as some sample batches of fruit blends and a high alcohol number called Woody. Needing some cider to braise our pork chops and apple with back at our BnB meant that we purchased a few bottles. Our day in the Huon Valley ended up being a very relaxed day ~ sometimes no plan is the best plan of all. We’d arranged to be in Hobart on a Saturday so we could visit the market that sets up in Salamanca place. I remembered, from my time living there in 2000, that the markets were full of locals and tourists, with the locals were buying fresh fruits and vegetables from Hmong families. The Hmong are an ethnic group from the mountainous regions of China, Vietnam, Laos and Thailand. 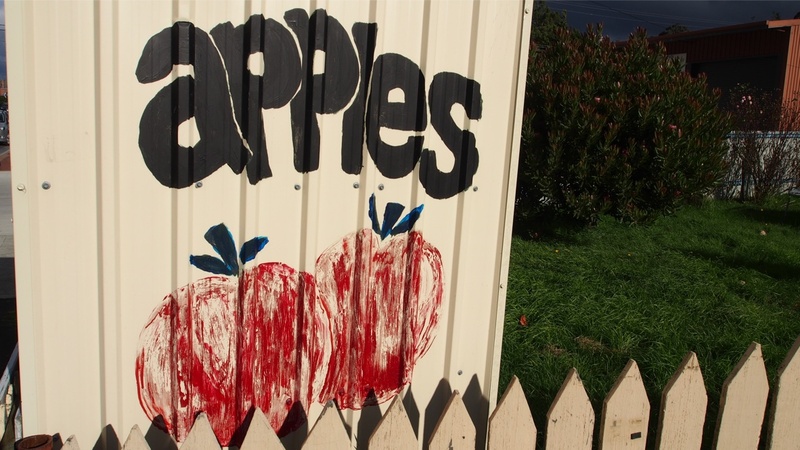 They have been growing and selling in Tassie since the 70s. I was pleased to see the beautiful array of greens and seasonal fruits still proudly displayed. In 2000 there were older ladies selling with their grandchildren doing all the talking in English. Fifteen years later it seems the kids, most University-aged or just younger, have taken over the stalls and were now giving granny a break. The craft, pottery, silver work and woodwork area of the market used to be a great place to pick up a nice gift or special item for you home. It seems now though that there is more tourist-oriented ‘stuff’ and the real artisan goods are a little harder to find. Maybe it’s a sign of economic times. There were some exceptions though and were some beautiful hand-woven items like woollen scarves, ponchos and beanies. The best thing about Salamanca Place for us was lunch at a restaurant around the back in Salamanca Square. SMOLT is decorated with a sort of Danish modern vibe, but the menu couldn’t be sunnier or more southern European. 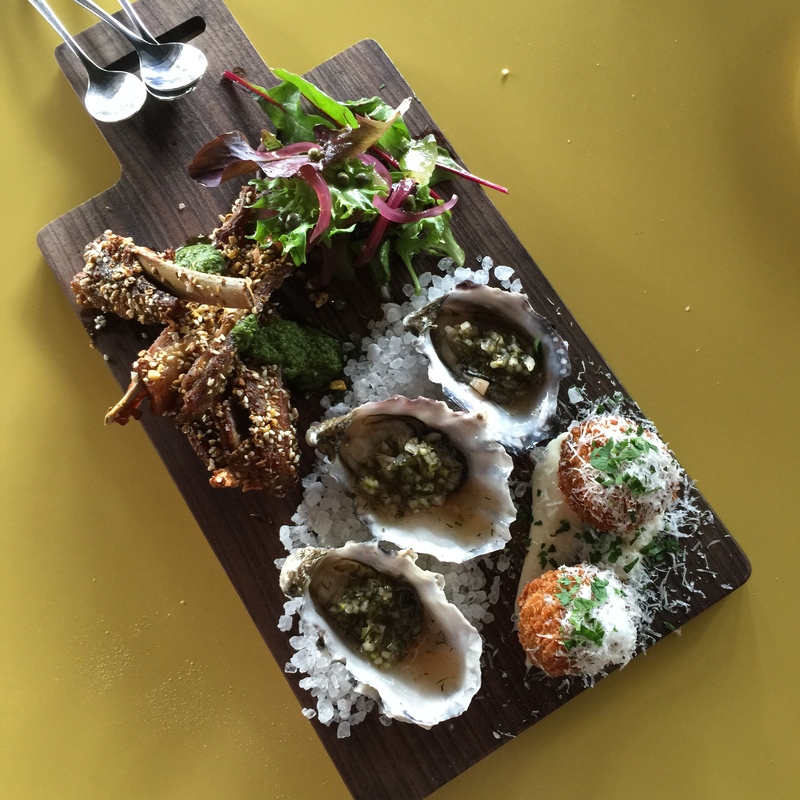 The menu is an eclectic mix of Spanish and Italian influences and its focus is on fresh seasonal ingredients. 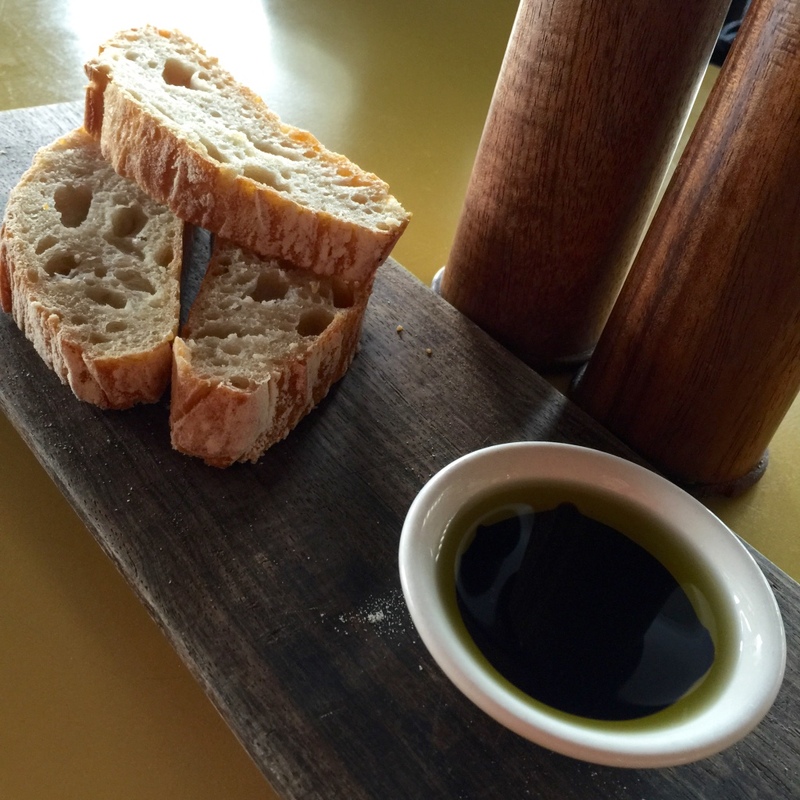 The sourdough bread is delicious, dipped in local olive oil and some balsamic vinegar. 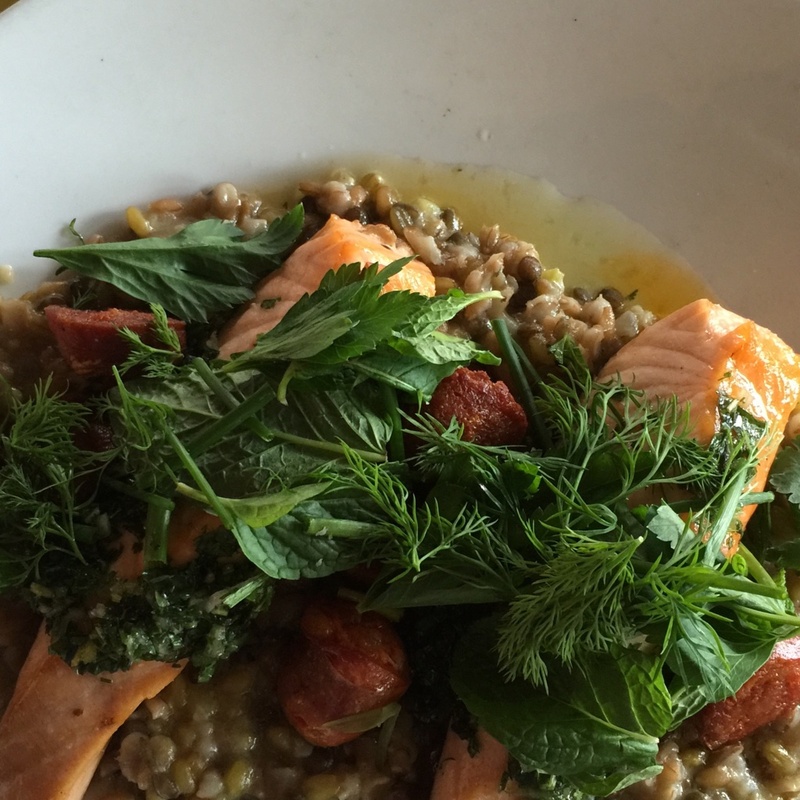 We shared a tasting platter of oysters, jamón croquettes and lamb cutlets to start then I chose the grilled Tasmanian salmon, faro, freekeh and du puy lentil braise, chimichurri, chorizo, herb salad for a main dish. 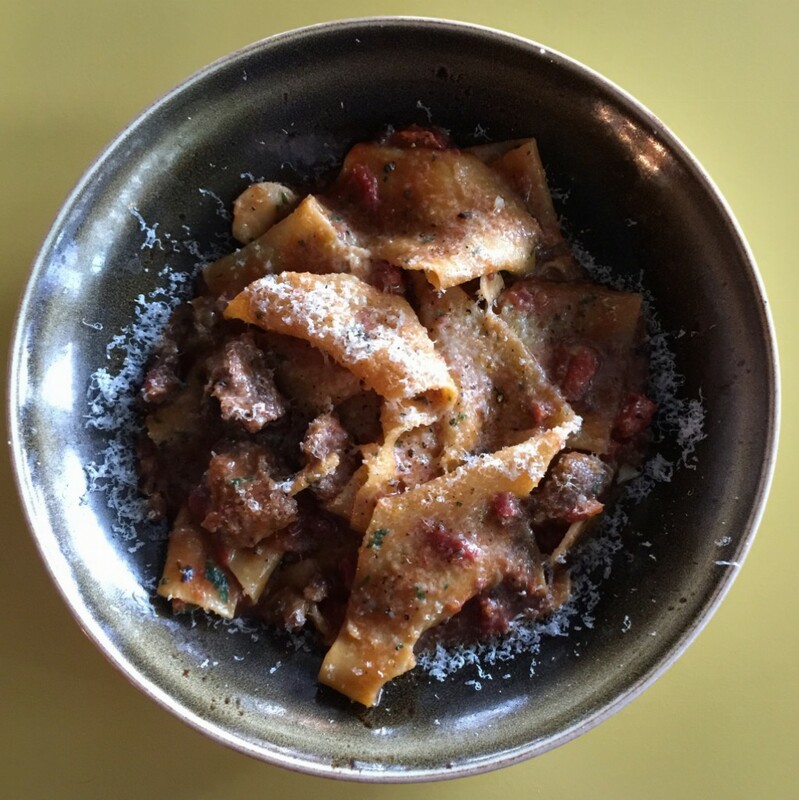 Roo and Amanda both chose the pappardelle with a lamb ragú. We were quiet and contemplative once the food arrived with the only talk being the occasional “oh my gawd this is freaking awesome” spoken in reverential tones. Smolt was a culinary bliss point on an island full of great food. Amanda departed for the airport later that afternoon. We drove the next day to Devonport and caught the ferry back to the mainland. It wasn’t easy to say goodbye to Tasmania again. 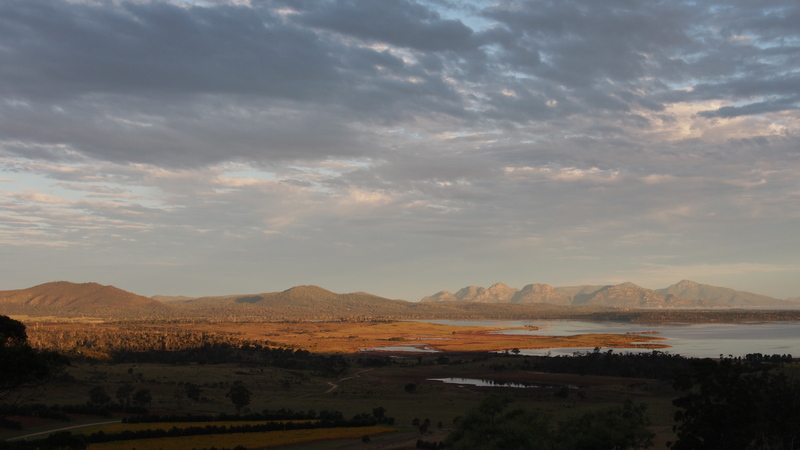 As I prepare to close part 2 of this post I am keenly aware that I could write 10 more posts about the 10 days we spent in Tasmania. It is truly a spectacular place and Australia’s crown jewel. 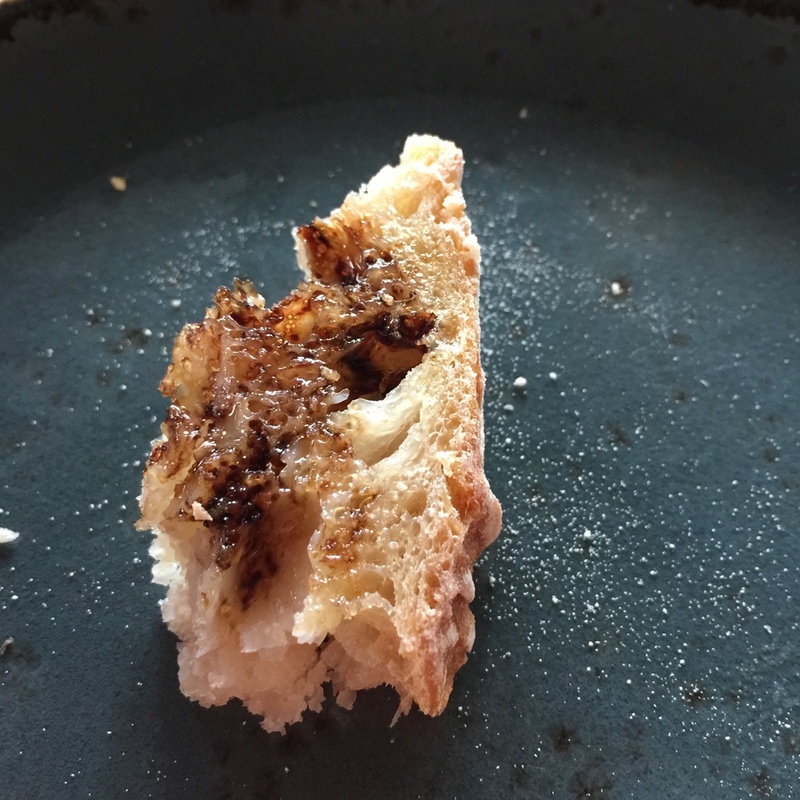 Previous Post Tasmania – Devilishly good! 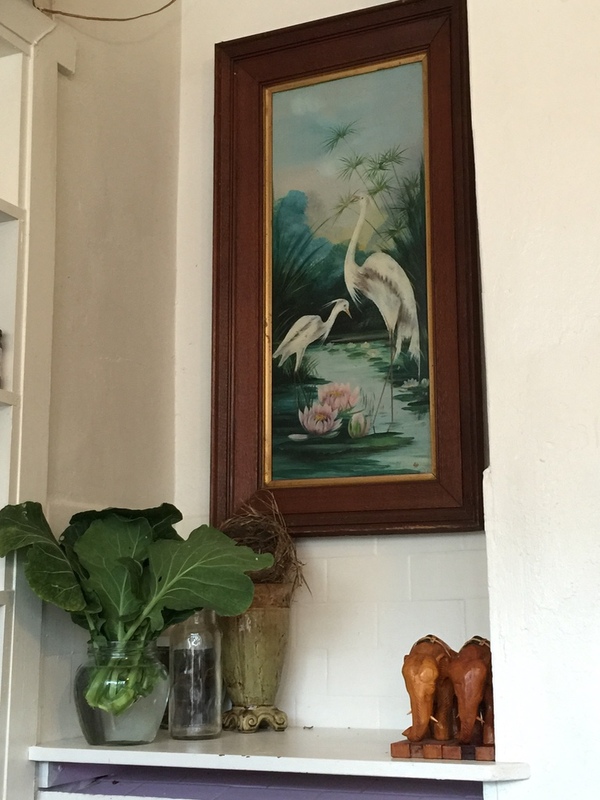 Next Post It’s Summer in Australia – where is MLT? Thanks! 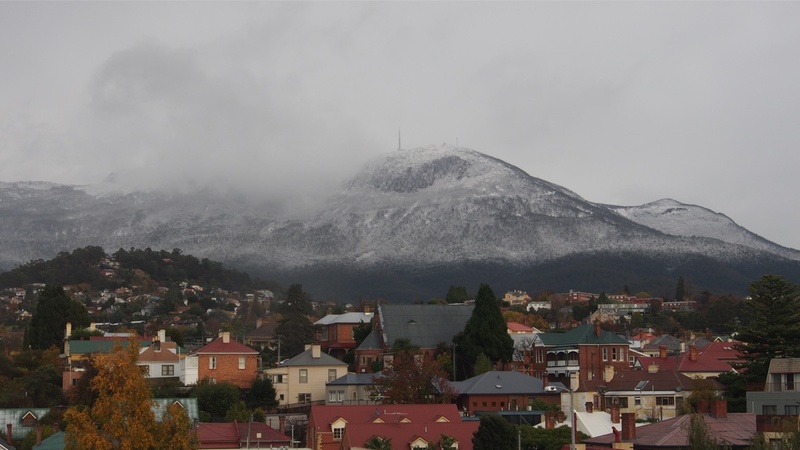 Tassie is incredible in any season.